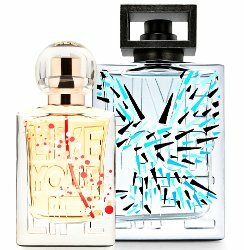 American Eagle has launched Live Your Life, a new fragrance duo for men and women. Live Your Life for Her ~ "Introducing our new Live Your Life fragrance for her. Romantic and sweet with a nod to our iconic heritage." With notes of pomegranate, citrus, red fruits, peony, orris butter, caramel, musk, woods, cashmere and gourmand accords. Live Your Life for Him ~ "Introducing our new Live Your Life fragrance for him. Fresh and woodsy with a nod to our iconic heritage." With bergamot, lemon, green notes, black pepper, lavender, cardamom, cedar, musk, amber and sandalwood. American Eagle Live Your Life for Her and for Him are available in 50 ml, $40 each.